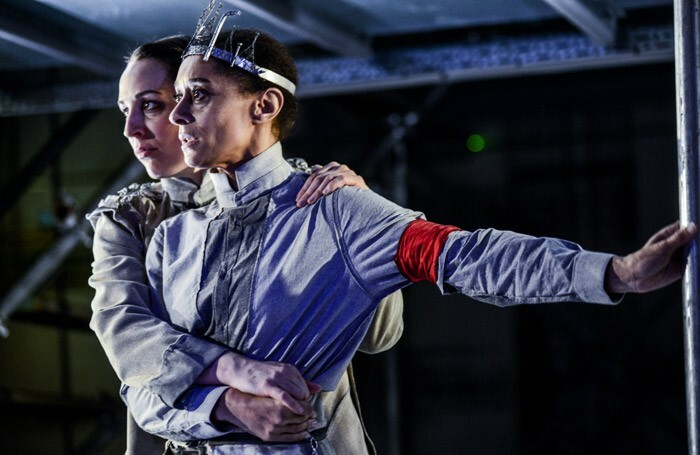 Following last year’s all-female production of Richard III, Omidaze Productions returns to the Wales Millennium Centre with an emotionally charged piece of promenade theatre. The Centre’s roof void acts as stage once more, the vast room and industrial aesthetic lending themselves well to a production that revels in both grit and grandeur. Technically, Henry VI is astonishing, not least in the discomforting harmony between Tic Ashfield’s Lynchian score and Elanor Higgins’ nightmarish lighting. Gabriella Slade’s stripped-back set gives the production a timeless quality, enhancing the play’s overt nods to contemporary conflict. Director Yvonne Murphy set herself the task of bridging three plays, and the side-effect of that ambitious process is an occasionally confusing narrative. Character development doesn’t suffer, thankfully, and the all-female cast of eight give incredibly strong performances. This is very much an ensemble piece, though as the only aerialist in the company, Hannah O’Leary perhaps inevitably stands out as Henry, even if her circus skills often feel shoehorned into the production. In terms of innovation, the production really soars and Murphy deserves plaudits for attempting to present Shakespeare in such a bold and refreshing fashion. It’s a remarkable achievement, evidence of a director whose skill matches the daring of her vision.